When your jobsites demand long-lasting durability and performance, you need the Ditch Witch SK800—the perfect mini skid steer for a variety of jobs large and small. 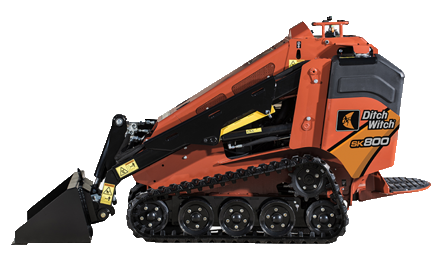 This construction-grade machine is built for heavy-duty operation on a range of utility, landscaping and other underground construction tasks, giving you maximum power and durability while increasing your Return on Investment. The toughest challenges are no match for the versatile SK800. An efficient, low-maintenance 24.8-hp Kubota diesel engine provides exceptional power to all machine functions. With an 390-kg rated operating capacity and an 2.1 metre hinge-pin height, the SK800 enables productive loading and the ability to handle heavy-duty tasks. Equipped with 4.8-mph ground drive speed in both forward and reverse for enhanced jobsite efficiency. Accepts a variety of attachments for a wide range of utility, landscaping, plumbing and other underground construction tasks, improving customer ROI. Industry-leading power to the attachment provides unbeatable productivity, especially when operating hydraulic attachments, and increases jobsite cycle times. Advanced attachment-latching system for simple, secure connection of the attachments. A two-way, easy-to-use auxiliary control foot pedal enables operators to maintain hydraulic flow to the attachment while freeing their hands to control depth and ground speed. .
A single-point, lockable fuel and hydraulic fluid tank improve security and provide rental companies peace of mind. The rugged, construction-grade design is built for heavy-duty operation, improving machine durability, longevity and overall machine ROI. An innovative high-drive track system features bolt-on sprockets and wide track rollers for enhanced stability, longer track life and ease of maintenance. Low-maintenance, track-tensioning system is equipped with a grease cylinder for easy adjustment and track removal, improving machine longevity and minimising downtime. Designed specifically with the hardworking operator in mind, the SK800 is equipped with a best-in-class, 74-in2 (188-cm2) operator platform for outstanding comfort and productivity during long hours on the job. A spring-supported platform is integrated directly into the machine for enhanced durability and comfortability on the job. Ergonomic operator's station comes standard with dual-lever ground drive controls and an optional joystick, allowing the operator to control each track independently for improved maintenance and mobility on difficult jobsite conditions. An LCD display with programming improvements provides direct visibility into engine diagnostics.